Some bands I feel something extra for already from the very first listening and when I heard these Swedish crusaders in Astral Doors for the first time back in 2005, the chorus from the track "Evil Is Forever" got stuck into my head and I was convinced that this bunch of talented musicians would be both big and famous in no time. I was wrong that time and when the strong album "Astralism" came in 2006, I was ready to bet a month's salary on that it was Astral Doors' time to make it onto the big stages. 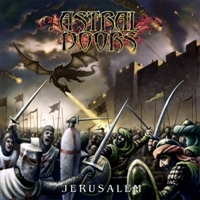 Now it's 2011 and Astral Doors give us the album; "Jerusalem" and I have to say for a 3rd time: Discover Astral Doors' greatness in this genre. Nils Patrik Johansson on vocals is a powerpack as the front man/leader and the kinship with Dio-fronted Rainbow and Dio/Martin-fronted Black Sabbath is obvious. "Jerusalem" is a concept album with religious history conflicts as the themes and as it often is the case with Astral Doors lyrics; they have strong context and meaning. They play without frills and have a straight attitude in their powerfull rock and they play it as the very, very best in their discography. For the solid production we thank Daniel Bergstrand, behind the mixing console. Astral Doors should appeal to a wider audience and if you have the opportunity to see them live on their European tour that starts in Munich 15/10, I'll just say one thing: Get the tickets now! Best tracks: "Seventh Crusade", "Lost Crucifix", "Babylon Rise" and "Jerusalem".